When his father betrays a dangerous king, Owen is forced to leave his family and live in the castle as a hostage to ensure his family’s loyalty. If his father’s loyalty falters again, Owen will be cast into the river to die, as his eldest brother was. As the youngest son of the Duke of Kiskaddon, Owen is alone in a castle full of spies. To survive, he must discover allies and prove himself valuable to the king. 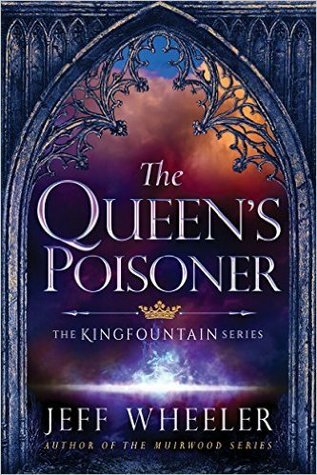 The storyworld in The Queen’s Poisoner was simple yet vivid and believable. I loved the way water factored into the lore and traditions of the kingdom. Someone with a special ability is said to be Fountain-blessed. Traitors are sent over the waterfall to their deaths. Even the simple addition of the game of Wizr (a chess-like game) and how it factored into the story as a framework for Owen learning strategy added deeper layers to the story. Owen is immediately likeable and fascinating. I definitely wanted him to survive. I loved his friends, from the cook Liona to the poisoner Ankarrette to the loquacious Elysabeth Victoria Mortimer. Wheeler describes The Queen’s Poisoner as the first book he’s written from a boy’s perspective. Though the adult characters played very strong roles (as the title indicates, in many ways Ankarrette is the heroine of the tale,) the story still centered around Owen’s point-of-view and his growing understanding of the world around him. I’m often nervous reading books by authors as prolific as Jeff Wheeler. Sometimes books being published so closely together means the writing feels rushed or the story underdeveloped. I didn’t sense that at all in this story. I felt like the voice was developed and the writing was very clean and enjoyable. I would definitely recommend this story and would love to read other books in the Kingfountain series. The king executes traitors by tying them up in a boat and sending it over a waterfall. About one in one hundred people survive. Executions are often public, and Owen attends one. The queen’s poisoner is educated in how to use medicines and poisons to help or hurt people. She gives Owen a tea to help strengthen his lungs, but she has used poisons in the past to kill at the command of the king. Tagged 47North, Author Copy, Jeff Wheeler, Kingfountain Series, The Queen's Poisoner. Bookmark the permalink.